Graphic design is a creative process that combines art and technology to communicate ideas. 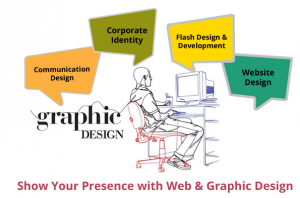 Role of a graphic design is very important in the growth of a business and its identity. The graphic designer works with a variety of communication tools in order to convey a message from a client to an audience. It is very helpful in improving the appearance and feels of a website, catch the attention of audience, communicate the message of the businesses and motivate their mind efficiently. Hiring a graphic design firm can give you the edge over your competition by adding a professional and cohesive look to your marketing materials and collateral. Omkarsoft is a creative Graphic Design Company also specializes in providing website design, logo design and flash designs. We have top-notch designers who can provide you a clean professional art work. We use the latest graphic design software and skilled graphic designers to create attractive logo design, brochure design etc. We offer a range of custom graphic design services to assist you in establishing a strong position in your target industry. Our talented team of illustrators, animators and programmers can help you with all your graphics, design, animation and imaging needs. We have created hundreds of graphic designs for many types of website. We have professional in-house graphic designers to take care of all your initiatives.